30 LC DBM Rock Movement From his collection of rocks, Scott Con- ner transports what he needs for a given project by loading them into the back of a pickup and trailer with a mini excavator, which is then used to place them. Matthew Giampietro reports that the is - land's terrain on his project was so rough that machines often could not get next to the selected large rocks. So the crew would drive excavators or ATVs as close as possible, attach ropes to them and then pull them as close to the project site as they could. To place the large stones, the crew would slide them on planks, roll them on top of pipes, and adjust them with pry bars. His "patient crew" not only helped him set over 500 large stones, but also line the water feature with hundreds of small rocks collected from the shore, sift - ed to remove the sand, and carried to the site in buckets To get his rocks out of the forest, Car - men Marsala likes to use a two-wheel rock dolly, which can carry up to 500 pounds. He uses a pry bar to lift them on to the dolly, and a ramp to get the dolly into the truck bed. Recently, Marsala purchased a mini skid steer to help place rocks and is checking with the Forest Service to see if he can use it to gather them. Glacier View's six-man crew mainly re - lied on "Egyptian engineering" to set the rocks in the project featured here. "We used steel rollers, brute force and ignorance," says Dave White. "With small backyards, getting a machine in makes more mess than it's worth." However, he did have to bring in a crane in to set the large granite boulders. Man-Made Materials All of the projects in this story included pumps, various diameters of flex pipe, solid PVC and rubberized tubing with metal coil inside, and pond liners. Some of them used waterfall boxes, dif - ferent sizes of underground reservoirs, and other materials beneath the liners such as a polyethylene fabric on one of Scott Conner's projects, and several lay - ers of woven weed barrier on the Glacier View project. Also on that one, there is an auto-fill feature connected to the irrigation sys - Left & Inset Masking freeway noise at this house in Dunsmuir, Calif., south of Mt. 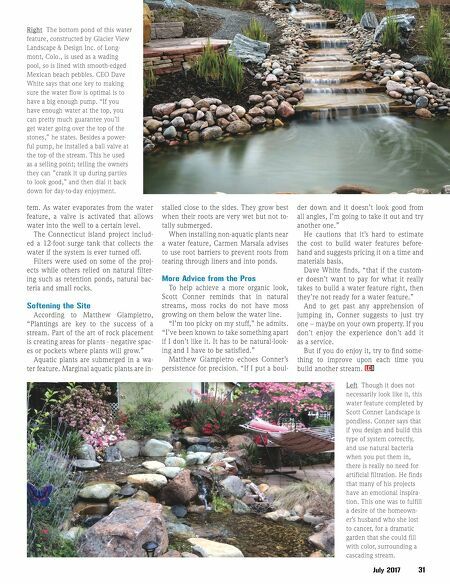 Shasta, was key motivation for Cameron Marsala, the owner of Camelot Landscaping and Stoneworks (and the owner of the house that he was renting to tenants at the time) to build this small stream with waterfalls. He purposefully located it in the corner so it would echo loud enough to be heard from the house. He strongly advises to install some kind of a membrane before the liner to protect it from getting punctured. For his rocks, Marsala often gets a permit from the U.S. Forest Service, which allows him to get a truckload of them (inset). Left Scott Conner Landscape of Paradise, Calif., about 90 miles north of Sacramento, built this project for local residents that involved two streams with a series of falls, a koi pond, fountains and pond plantings such as the tall water iris on the right in the photo, the lotus next to it and the water hyacinth in the foreground, which are able to remove algae-causing nutrients. Growing up in the foothills of the Sierra Nevada, Conner says that he often observed natural streams, and came to better understand how they function. 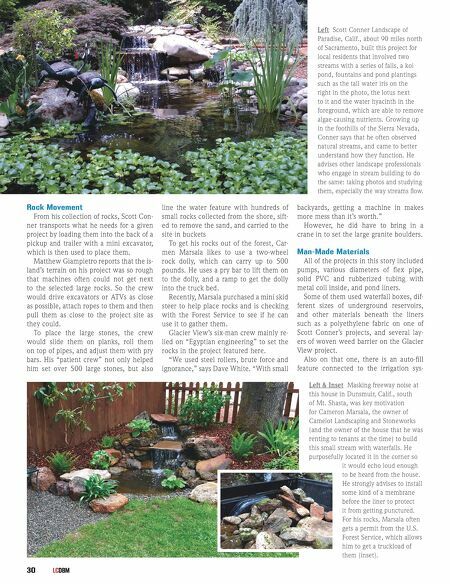 He advises other landscape professionals who engage in stream building to do the same: taking photos and studying them, especially the way streams flow.